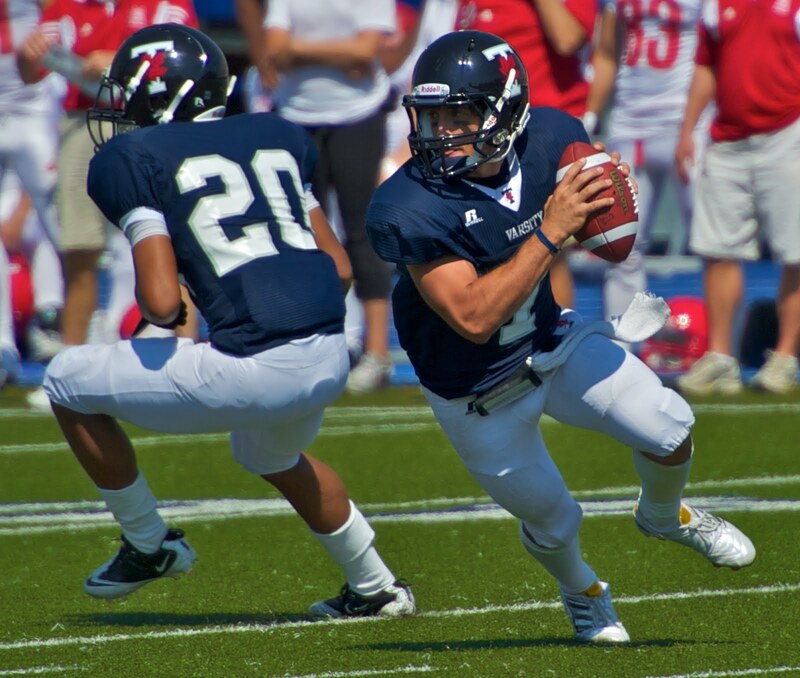 Quarterback Andrew Gillis returns to lead his U of T Varsity Blues football team this season. Courtesy Matt Wright. In 50 words or less: After years of being awful, the Varsity Blues are now mediocre. They want to move up to "competitive" but it won’t be easy. 1) HOW will the Blues show that their win over the Ottawa Gee-Gees was not a fluke? 2) WHAT challenges lie ahead for new Head Coach Greg Gary? 3) WHO will step up on the defensive side of the football? What began as a year with no expectations turned out to produce one of the better Blues football campaigns since the mid-1990s. While their forfeit win against the Laurier Golden Hawks was not so impressive (it was a 37-6 loss originally), and their march over the York Lions, 24–19 on Sept. 18, was expected, the Blues can hold their heads high. A 40–35 shootout win over the highly-ranked Ottawa Gee-Gees is not something to scoff at. In fact, the Blues nearly won their game against the Guelph Gryphons, but lost on a last second field goal, and could have upset the Western Mustangs and McMaster Marauders, in games where they had halftime leads. “I know ‘coulda, woulda, shoulda, didn’t,’” said John Engel, the Blues' offensive co-ordinator, who is happy with the season’s results, but looks at them with skepticism. But, I swear, the coaching staff are excited to get out there and get those wins this season. More below. RB Walter Cariazo, OL Josh Gibbs, OL Ross Asaro, and DL Mark Evans also graduated. Some key recruits include OL Brendan O’Brady, FB Brooks Wilson, DL Cory Rutledge, and QB Richard Quittenton—potentially the quarterback of the future. Toronto also had a few transfers, most notably S Dorian Munroe, who comes from the Florida Gators. Keep an eye on: There are a few that deserve a look this season, if they get significant snaps. S Trevor Harvey was a recruit, who injured himself before the season, last year who could be filling in the gap left by Kennedy and Batchelor’s departures. S Willie Sharpe has been testing better in the weight room and could have a breakout season. Offensively, we have our eyes trained on QB Andrew Gillis, who will be looking to build off the confidence of last season’s wins, and HB Aaron Milton (below), who has a skill set similar to the Stampeders' Joffrey Reynolds. Michael Prempeh should also get honourable mention. In limited time last season, Aaron Milton (left) was very effective. Expect more of it this year. Courtesy Dan Epstein. Coach & coordinators: Your eyes are not fooling you. There is a new head coach for the downtown Toronto squad. Greg Gary, a former linebacker coach for the Blues and a successful coach in the Ontario Varsity Football League, is looking to pick up where former coach Greg DeLaval—who resigned to take a job with the Calgary Dinos—left off. This is a big change from the OVFL, but Gary appears to understand the challenge. “The actual coaching part remains the same, you still coach football. It’s a little more sophisticated at this level, but it’s still about relationships,” he said. Gary considers himself a “relationship guy,” and he will need that. “There’s a lot of holdovers from last season, so trusting the guys we have does pose the biggest obstacle.” The schemes will also be more complex, but Gary sounded confident about his learning curve. Then again, Gary did not have to overhaul his coaching staff. Engel, a York Yeoman alum (don’t let that factoid spread too quickly) and former Etobicoke Eagles coach, is bringing a new scheme to the offense this year. “We’re going to put an emphasis on speed, flying around and we got some great athletes at receiver and tailback,” he quipped. Engel is also the Director of Recruiting. Defensive co-ordinator Donnavan Carter, a Northern Illinois alum who played in the CFL for eight years, is a sharp mind. He previously coached with the Toronto Argonauts. A lot of the focus for the defense should be on discipline. The Blues ranked in the top 10 in penalties and penalty yards. Off-the-field factors: How this team tests in the weight room and on the practice field pose the biggest factors for their success this season. Engel says that recruiting true linemen studs are difficult, and the team is slightly undersized at key positions, but the current crew should be able to hold ship. Gary says that his team wants to be more disciplined and well conditioned for fourth-quarter football, making fast smart decisions on key plays. From last season's preview: Mike Radoslav had the pleasure of writing about one of the oldest football programs in the country. His preview was probably as optimistic as my preview is in tone. Many of last season's key arrivals actually did play due to injuries. With few roster changes over the winter, I can see the same guys stepping up. As well, unlike past seasons, the Blues were not shut out in 2010. They were blown out, but that's another issue. They seem to have it more together than the average team trying to adjust to a new coach. With that said, forecasting their season is pretty difficult. I say they finish 3–5, avoiding any blowouts, but losing some tough games. The team should also excel, relatively speaking, at home: their two non-forfeit wins last season were at the Varsity Centre. Swing games: The team begins the season with two road games in six days, including a grudge match against their city rivals at York on Sept. 10. Not pretty. Luckily, the first three games are all winnable in theory. The Blues will have to win at least two of those games to consider themselves competitive for the rest of the season. 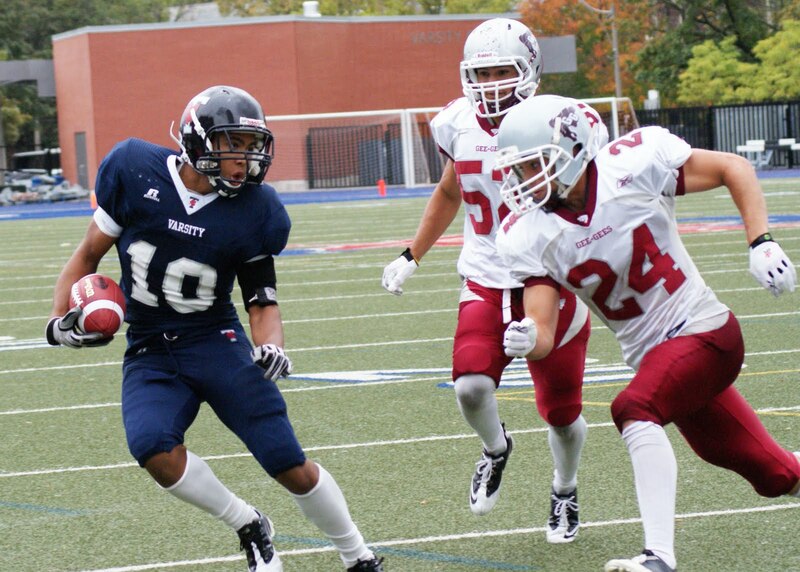 Otherwise, they get the Gee-Gees, Queen’s Golden Gaels, Marauders, and Mustangs in four consecutive weeks. Not a pretty part of the schedule. Stock up or stock down: Up. Like the coaching staff, I need to see better results on the field. We should be careful not to get too high on the Blues, but three wins is still a step in the right direction.